Your eye is like a camera with a lens that focuses light. Light rays travel into our eye through the pupil and are focused through the lens onto the retina, a layer of light-sensitive cells at the back of the eye. The lens must remain clear in order to focus light properly onto the retina. A cataract is simply a clouding of this natural lens. The living cells that make up the lens are specialized to remain clear; however, as we age, these living cells have more difficulty remaining transparent. The lens is contained within a bag inside your eye. As these cells live, grow, divide and produce waste products, the lens becomes bigger and more compact. The waste products begin to accumulate within the cells causing the lens to become cloudy. Most people over the age of 50 have some clouding of their lens that could be called a cataract, yet they do not have any visual problems. Just because your eye doctor says you have a cataract, it does not mean you need to have it treated. If your are experiencing visual problems that are keeping your from doing what you like to do and it is determined that the reason for your visual problems is a cataract, you should consider cataract surgery. Currently, the only treatment for cataracts is to surgically remove the eye’s natural lens and replace it with a clear artificial lens implant called an intraocular lens, or IOL. Cataract surgery is one of the most common and safest surgical procedures performed today. Over 1.5 million cataract surgeries are performed each year. Less than 2% of patients have complications and over 95% result in improved vision. The surgical procedure to remove cataracts is performed in an outpatient setting with minimal anesthesia. Most patients only need a mild sedative and a topical drop to numb the eye. The procedure usually takes less than 15 minutes and patients usually have only minimal to no discomfort during the surgery. The surgeon creates a small incision in the side of the cornea. Using ultrasound, the cataract is broken into small pieces and removed from the eye. Once removed, the artificial lens (IOL) is folded and then inserted into the eye. It is placed in the bag the previously held the natural lens. This IOL becomes a permanent part of your eye. The incision is created in such a way that it seals itself and does not require the use of stitches. Recovery from cataract surgery is usually quick. Many patients see well within the first couple of days, but, depending on the health of your eye and your cataract, it may take a few weeks to clear completely. You will be prescribed eye drops that must be taken according to your surgeon’s orders for your eye to heal properly. It is very important to protect your eye for the first week after surgery. Be sure not to rub your eye. You should also avoid strenuous activity such as exercise or heavy lifting for at least one weeks as well. 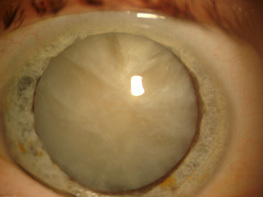 Fortunately, complications with cataract surgery are very rare. If a complication does occur, most times, it can be treated and great vision can still be obtained. While many patients do not require distance glasses after today’s modern cataract surgery, that should not be the expectation. Many patients still prefer to wear distance correction after their surgery. Unless you choose a new technology intra-ocular lens, you will need to wear reading glasses or bifocals after cataract surgery. Great advancements have been made in intra-ocular lenses. These new technology lenses give many patients alternatives to help fine-tune their post-operative vision. These lenses can correct for astigmatism and for loss of reading vision (presbyopia). See below for more on possible lens choices for cataract surgery. Once your cataract has been removed, it can never return. Some patients will develop gradual blurring of their vision that is similar to how their cataract symptoms began. This time, it is due to a film or scar tissue that forms over the back surface of the bag the is now holding the artificial lens. 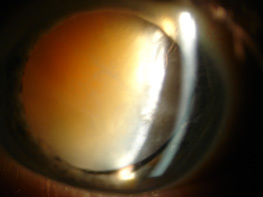 This can develop within months after cataract surgery or years later. This haze can be treated safely and easily with a quick laser procedure. A YAG capsulotomy is the procedure where a hole is created in the center of the cloudy bag. This can be done in an exam room and had not post-operative care or restrictions. There are many types of IOLs available. Depending on your needs and desires for post-operative vision, the lens can be tailored to you after a thorough examination. We try to minimize the refractive error (need for glasses) as much as possible during cataract surgery to lessen our patients’ dependency on glasses post-operatively. More precise pre-operative equipment allows us to be more accurate with our lens selection for your surgery giving patients fantastic vision. This is the traditional IOL. It focuses light at a set distance - far, near, or intermediate. It corrects for near-sightedness or far-sightedness only. Corrective lenses may be needed after cataract surgery with this IOL to compensate for your visual needs. We use the most advanced monofocal intraocular lenses available, the wavefront optimized lenses, whenever possible. These IOLs have the best potential for visual quality and for better night vision. When implanted in both eyes, many chose a distance focus point providing great distance vision without glasses. A prescription will likely be needed for near and possibly intermediate vision. Some patients still require a small distance correction to give them the sharpest vision, especially if you have astigmatism. Some chose to have both eyes corrected for near vision allowing them to read without glasses. This works well for some, but a distance prescription will be required for driving and other activities dependent on clear distance vision. A small number of patients have worn contact lenses that focus one eye for distance and one eye for near. This is called monovision. This works well for those who do not want to wear reading glasses. During your cataract surgery, we can focus your eyes like this with the monofocal lens allowing you to see both distance and near without corrective lenses. 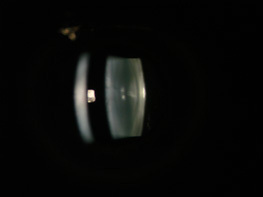 This is a monofocal lens as described above, but it also corrects astigmatism. Astigmatism is a condition that causes vision to be blurred beyond near-sightedness and far-sightedness. The cornea is the clear front portion of your eye. 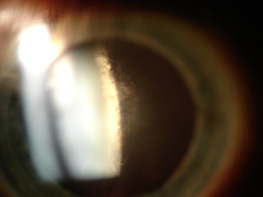 As light passes through the cornea, it is focused. If your cornea is perfectly round, or spherical, having the same amount of curvature in all directions, all light is focused the same amount. Many people have a cornea that is shaped like a football with the amount of curvature in one direction greater than the curvature in the other direction 90 degrees away. This causes the light that passes through the cornea to be focused different amounts depending on which part of the cornea it is traveling through. That is astigmatism. 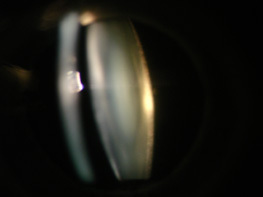 After a thorough examination and careful corneal measurements, we can determine if you are a candidate for this lens. If you have astigmatism and it is not corrected during cataract surgery, your vision will remain blurred without corrective lenses. Toric lenses give those with astigmatism the best opportunity to see their best, with and without glasses. This newer IOL allows for greater range of vision and decreased dependency on glasses or contacts. Correction for distance, near, and intermediate is built into the lens. For those patients who have a desire to be free from corrective lenses, this could be a great option. This lens is not an option for everyone. To be a good candidate, you must have healthy eyes. Any other problem with your eyes can significantly diminish the benefit you get with this lens. If you are interested in being free from glasses for everything, ask your surgeon about the multifocal lens. Your surgeon will determine whether our not it is a good choice for you. As will all things in medicine, we cannot guarantee that you will be free from glasses with any of these lenses. Studies and our experience show that over 80% of those selecting the monofocal lenses do not require corrective lenses to see at distance. Many still do wear glasses full-time as this allows them to have their bifocal at all times. For those that select the ReSTOR multifocal lens, over 80% of those patients do not wear glasses for anything. Some wear glasses only occasionally for certain situations. Less than 5% wear glasses full-time after this lens is implanted.